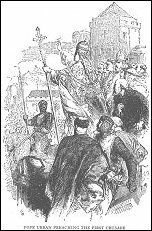 The illustration is "Pope Urban preaching the first Crusade" from the book by Charles MacKay, 1841. Religion, unlike skin colour, is a matter of choice, so criticism of others' religious beliefs is legitimate. The sites here go beyond that by substituting abuse for criticism or by being gratuitously offensive. For the special case of religious idiocy called creationism, please click here. See some answers to religious bigotry here. You can go here to see articles I have written about religion, and here to see articles by other people. The Millenium Bookshop has books about religion and its effects. Hindu Unity - Soldiers of Hindutva! Awake Hindus! !